While I had Sarah quilt Tsuru Swoon and Cascade, I decided to also send her this quilt top that had been waiting to be quilted since last winter. 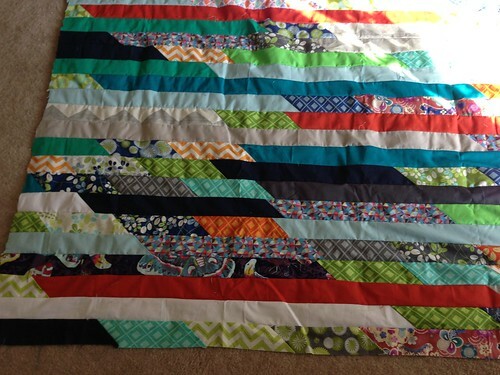 It is a take on a jelly roll race cut from various yardage and scraps I had. Basically I cut a reusable shopping bag’s worth of 2.5″ strips and sewed them together randomly. Then I folded the long strip in half and sewed that together, and so on until I reached a rectangle. The section in the middle where the gray chevrons come together was a complete accident. Apparently I had placed the strips just so that they came together like that. I had half a mind to stop, rip it out and move one of them but I didn’t and I’m glad. It definitely gives the quilt some interest. 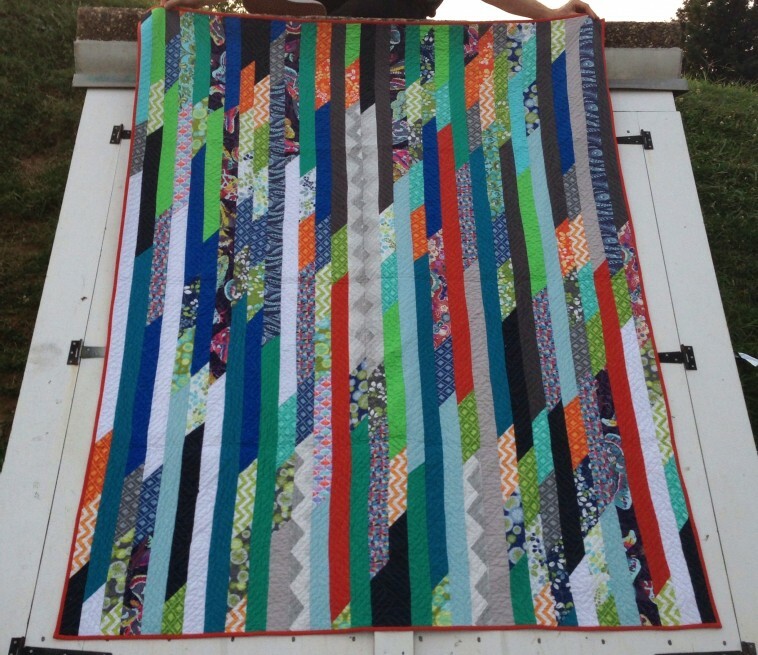 Based on the date stamp it looks like I finished this quilt top in early December of last year. Good thing it’s finished! This was quilted with a maze pattern and bound with the same red that’s in the quilt. It is backed in a gray plaid. It finished approximately 64″ x 84″.